Antarctica … the land of ice, snow and no permanent residents. I never thought I would have the opportunity to visit the world’s most isolated landmass, so my excitement level was through the roof last night as I traveled to Buenos Aires from Grand Rapids, Mich. via Newark, N.J. I have been to Argentina before and this was my third trip to this beautiful country. 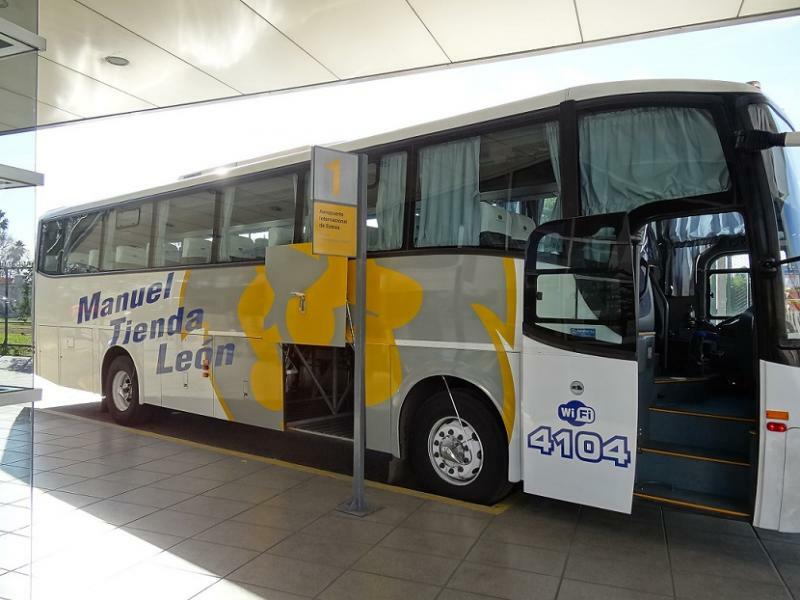 Flying into Buenos Aires, the capital of the republic, my United flight landed at Ministro Pastarini – also known as Ezeiza – around 10:50 a.m. After going through customs, I picked up my luggage and grabbed the Manuel León transfer bus to Buenos Aires’ domestic airport, Aeroparque Newberry. 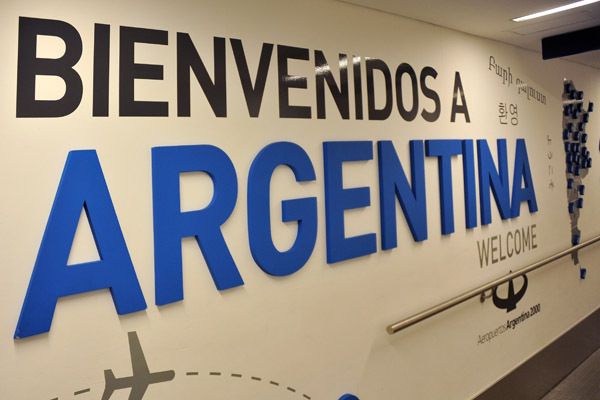 I love Buenos Aires, however I hate Aeroparque Newberry. Every time I have been to this airport, the lines and disorder have been maddening. I hoped for the best, but I was expecting the worst before we pulled up to the airport. Due to rush-hour traffic, my four-hour buffer was dwindling down fast. 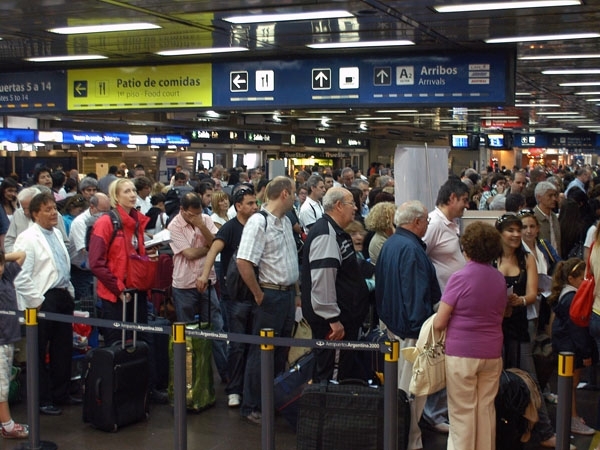 When I exited the microbus at Aeroparque Newberry and entered the terminal, it was as chaotic as ever. A freak storm had shut down the city and airport the day before, so people were scrambling to catch new flights. One line wrapped probably 400 yards down the terminal just to get to the Aerolíneas Argentinas check-in desk. My only hope of making my flight was if my brother made it to the line early. He arrived in Buenos Aires the night before for some sightseeing. After texting with Jeff, we weren’t connecting. I waited at the back of the line for a while before I received a text from Jeff. He was at the front of line. After walking to the front, Jeff called to me and I was excited to see him. I moved through the line explaining in Spanish that my brother was holding my spot. After a hug, we were almost at the front of the queue. Jeff explained he had been waiting for almost 2.5 hours! The Aerolíneas Argentinas agents were nice, but they looked like they were worn out from the chaos. After receiving our tickets, we headed straight to security and then to our gate. When our flight was called, we all boarded a bus that took us to our plane. Our Aerolineas Argentinas flight took off around 14:50 p.m. for Ushuaia. One thing that always impresses me about Argentina is how beautiful this country is. Flying over the vast Pampas, we eventually flew down the beautiful south Atlantic coastline. As we arrived over southern Patagonia, we began to see the end of the Andes Mountains as we arrived over Argentina’s final region, Tierra del Fuego (Land of Fire). Then we saw the city of Ushuaia as we began to descend gradually in a circular pattern to the airport below. This was our third time flying into Ushuaia, a precarious landing with the airport located on a spit in the Beagle Channel. High winds are common here and some landings can be aborted due to conditions. We made it smoothly, unlike our last journey here. 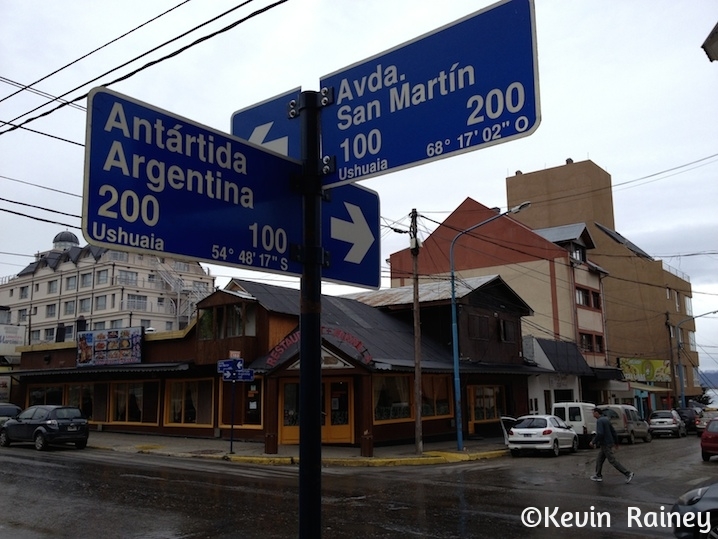 Ushuaia is the southernmost city in the world, although the Chilean town of Puerto Williams across the Channel disputes that claim. However, Ushuaia is truly a city and substantially bigger. Ushuaia continues to be an important commercial trade city due to its prime location on the tip of South America between the Pacific and Atlantic Oceans. Although the Panama Canal has diminished maritime trade passing through the Beagle Channel or around Cape Horn, traffic from the southern hemisphere continues to round the tip of South America. 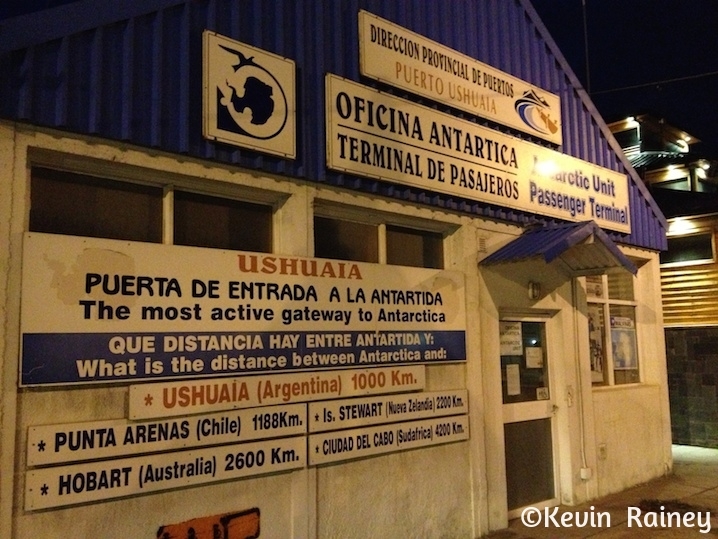 Today Ushuaia is an important destination for Antarctic departures since most visitors take a ship, not a plane to Antarctica. While a small number of ships depart from Australia, New Zealand and South Africa, approximately 90 percent of all departures begin and end in Ushuaia. The short Antarctic touring season lasts only about four months – from mid-November to mid-March – during summer in the Southern Hemisphere. We arrived around 18:30 p.m. in Ushuaia. Upon arrival, we retrieved our bags and we grabbed a taxi to town. We checked into our lodging – the Hostal Apart del Bosque – that Jeff had reserved online. Then we walked down to explore the waterfront. 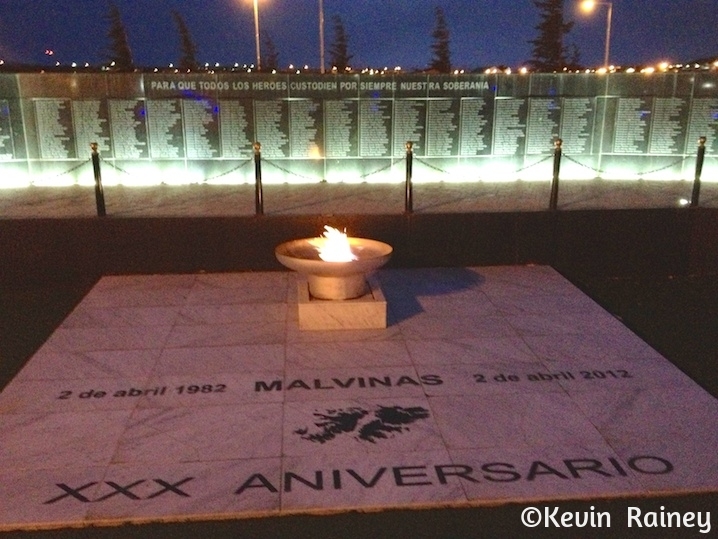 We saw the new Malvinas (Falklands) Memorial with its wall of honor and eternal flamed commemorating the Argentine soldiers who died in the 1982 war with the United Kingdom. We paid our respect to the soldiers who died serving the Argentine Republic on the battleship Belgrano, which set sail from Ushuaia. 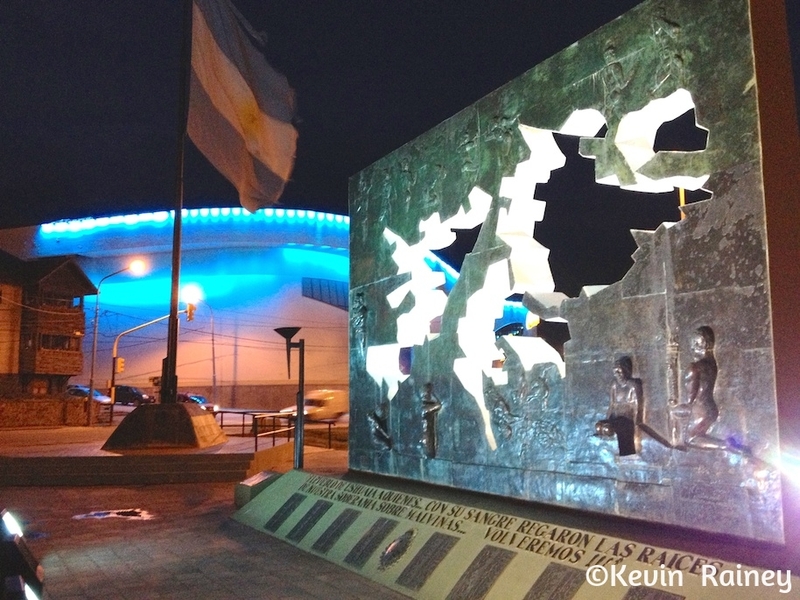 It is a very poignant memorial overlooking the harbor at night with the flame and Argentine flag whipping in the wind. Feelings are very strong today in Argentine that the Malvinas are Argentine territory. Argentina, like Chile, also claims sovereignty of portions of Antarctica. Afterwards we walked by the casino, but there was a cover charge, so we decided to skip it. We had a traditional Argentine steak dinner at the restaurant El Turco, located on Calle San Martín. Jeff and I had eaten here before and I enjoyed a bife de lomo, potatoes and a Quilmes cerveza. The restaurant’s décor is simple, but the food and service are always outstanding at El Turco. Then we headed back to our hotel to have a good night of sleep before our departure to Antarctica!